Canine rehabilitation therapy for dogs was unheard of just a few years ago, but today more pet pawrents are exploring its many benefits. 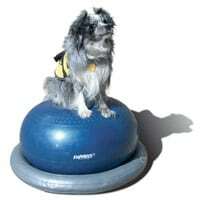 From pain management to acupuncture to the ever popular water therapy doggie treadmill, lots of dogs are enjoying better health and fitness because of increasing access to rehabilitation therapy centers. As a consequence of this emerging field, canine rehabilitation practitioners who offer their services possess skills that range from novice to expert. When it comes to choosing a canine rehabilitation center, it’s vital for pawrents to know what types of services and staff to look for. Unfortunately the rehabilitation field is not as tightly regulated as veterinary medical practices and unqualified practitioners do exist. Choosing the wrong canine rehabilitation therapy center can put your dog at risk of serious injury. 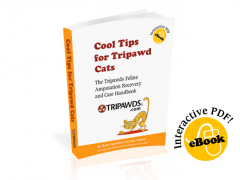 In the Tripawds e-book, Loving Life on Three Legs, you’ll find extensive information about how to choose a qualified doggie rehab center. We speak with experts like Dr. Amy Kramer, PT, DPT, CCRT, co-founder of California Animal Rehabilitation, who advises pawrents to seek out practices that have a veterinarian and a licensed canine rehabilitation practitioner working together. “If there’s no therapist and no veterinarian involved, then I think you’re missing a link in the chain of what works,” she says. A canine rehabilitation veterinarian can recognize and diagnose animal diseases, while canine rehab practitioners do not. Working with a center that doesn’t have a veterinarian on staff means that small signs of disease and illness could be overlooked, putting a dog’s health in jeopardy and potentially result in additional treatment costs. The following Whole Dog Journal article, “The Benefits of Canine Care and Conditioning,” discuses how to find a qualified practitioner in detail. You’ll learn about when it’s time to seek a rehabilitation vet, what types of services to look for and how to ensure your dog is getting excellent care. 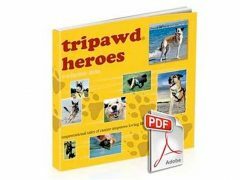 For more information about how your Tripawd can be healthy and happy on three legs for a lifetime, be sure to download the Tripawds e-book, Loving Life on Three Legs!